In Kenya in the early years of this century, young men in Nairobi’s Mathare slum were dying one by one at the hands of police and security officers. Sometimes it happened out of sight in custody, sometimes in broad daylight in the street. Other youths simply disappeared, their fates never determined. Everyone knew it was happening, but what could anyone do? Ruth Mumbi didn’t have the answer, but she knew she had to do something. As a teenaged resident of Mathare — a densely crowded settlement of narrow alleys, metal shacks, profound poverty, rampant crime, gang rapes, no hospitals, and no legal utilities — Mumbi took the only action available to her: She began keeping a record of the deaths and disappearances in a private journal. Mumbi, the seventh of nine siblings, lost her father when she was 10, making the harsh Mathare environment even harder for her family to survive. Nevertheless, she counts herself fortunate. Her younger sister was a brilliant student, but the sponsorship was not available to her, Mumbi said. The community scraped together money so the younger girl could go to school too. The sister completed high school but could not afford to continue her education. People in the community knew Mumbi was keeping a record of the deaths and disappearances. Eventually she learned some civil society organizations were interested in that information, and she became a point of contact for them inside the slum. Security forces also became aware of her activity, and she soon started receiving threats on her own life. She fled to another area of the capital where she feels somewhat safer. As Kenya experienced political violence after elections in 2008, Mumbi shifted her focus. Much of the violence was directed toward women. “The violence was instigated by the politicians, but the people who were mainly fighting were from the informal settlements — fighting on behalf of the politicians. Fighting for what?” she said. 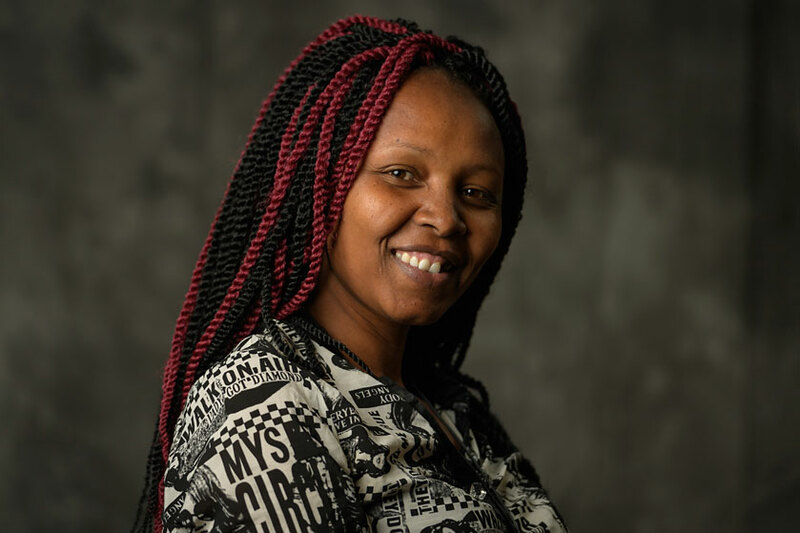 Out of that effort Mumbi founded Bunge La Wamama, a women’s chapter of Bunge La Mwananchi, an advocacy movement for social justice and accountability in Kenya. She is the group’s national coordinator. “When you empower a woman, you empower the whole world,” she said. “If my mom had been empowered, especially economically empowered, maybe I would have been a different person. Maybe if my dad was alive, because he knew how to hustle his way out, I might have been very different, maybe in a very different career. The message Mumbi has for her daughter and for all human rights defenders is to remain focused, remain resilient, remain consistent, and support one another.